For the three to four weeks that span the end of one year and the beginning of the next, I gift myself some space to look back over the last twelve months, and then to plan ahead for the coming twelve. I am fiercely protective of that time between Christmas and the second week of January in particular, when aside from a New Year’s Eve celebration (I can’t resist the excuse for a party, even a small one) I want nothing but quiet days at home. No plans, no rushing around, just time to rest and think. Planning ahead for the coming twelve months is a process I’ve improved in recent years, but one that I’ve really committed to diving deep with this year because I’ve seen so much fulfilment come for me in 2018 from learning to plan and goal set effectively. Last year was the year I fully realised the transformative power it can have over your life and work, creating more meaning, intention and fulfilment with everything you do. Effective goal setting is how I’ve been able to achieve so much this year, even though it’s been an unsettling and busy one where we moved house, relocated to a new town and I got pregnant with my second baby. I’ve kept on track with our renovations, and managed to push my business forward, because I’ve taken the time to map out what I want to get done each month, and crucially, how and when I plan to do those tasks. My time for planning and goal setting is fairly limited due to family and work commitments, so giving myself from mid-December through to Mid January to plot all this stuff out works best for me. I just don’t have the time to do it in a few intensive days, even though I’d love to be able to dive that deep in a shorter space of time, I just can’t. And if I don’t get it all set in stone by the end of January, I don’t sweat it. I just keep coming back to it, keep adding things and keep reflecting. I mean, start in February if you need or want to, there’s no rules, only what works best for you. I really believe it’s a process you should enjoy, to enable you to gain some perspective and clarity around your life and work. The most important thing is that you start from a place of honesty about what you really want out of your next twelve months, not setting goals like “make 100k this year” if that isn’t something that aligns with your life, work and values. It’s your planning process, your goals to set, and it has to be of meaning to you. I use the planning process to help me find more balance, to work on all the different areas of my life and set some goals for work, family, wellbeing and creativity. That’s when I’m the happiest, when I devote attention to all those things. For you, it might be something different, and it might change year on year. But I urge you to cut out the noise of what everyone else is doing and get laser focused on what will bring you the most joy and fulfilment out of the coming year. So, how do I plan ahead for the year? There are a few elements to my reflection, planning and goal setting process. I use a few different tools, and ultimately end up with several different physical and digital systems to inspire, motivate and track my progress. It’s not a linear process for me, and as I mentioned above it takes me about 3-4 weeks to be fully formed. I work on each area below a bit at a time as I feel drawn to thinking in a more visual, analytical or verbal way. I start with what feels right, and just shift my focus as I go until I have a full set of reflections, plans and goals. 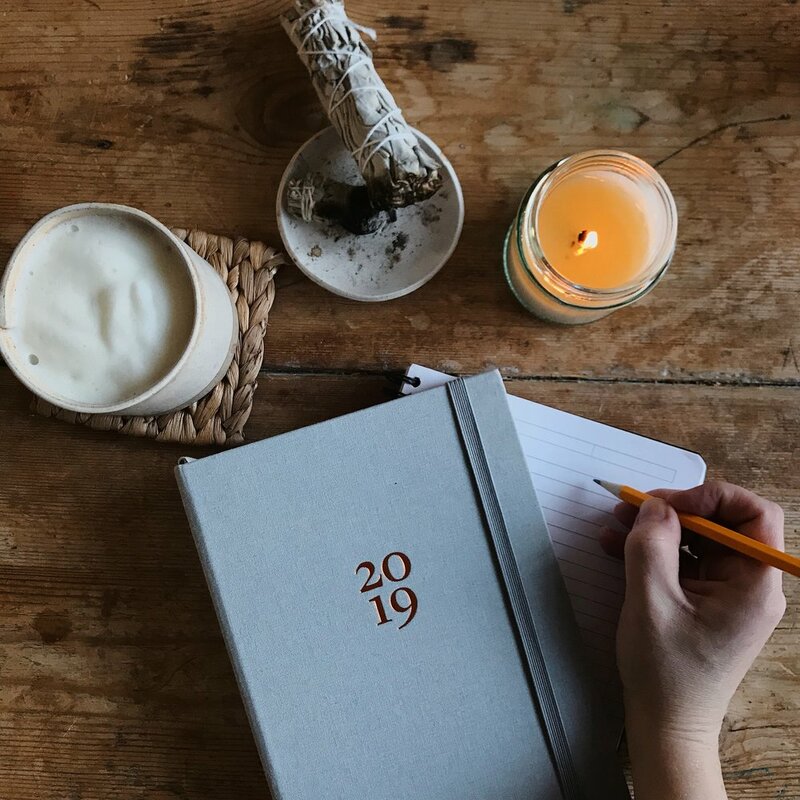 Reflection: I use Susannah Conway’s ‘Unravel Your Year’ and The Year Compass workbook to look back over the past 12 months to see what worked, what didn’t, what I achieved and how I felt about both positive and negative experiences. This process helps me start to pull out what I want to bring more of into my life in the coming year, and what I want to let go of. Take time to dream: I use the same resources as I do for reflecting on the past year, to dream ahead for the next twelve months. I work out all the things I want to achieve for the next twelve months, and let myself go as big or as small as I feel I need to at this stage. It combines things in my personal and work life, and I always plan those two things together to give me a holistic plan for my life as a whole. Map out your year into quarters: this is something I only started doing this year, after using Amy Porterfield’s 2019 Planning Roadmap. I split out all my dreamy goals, plans and ideas into four parts, and my year starts to take shape. Create monthly goals with clear tasks and deadline dates: I take my quarterly year map, and start to break down my ideas and dreams into monthly goals. Each goal gets separated into tasks, with deadlines assigned to each one and ideally a date in my diary to get to work on them too. I keep my personal monthly goals as a hand written list, and my work goals as an excel spreadsheet, but they have the same principles. Write your goal, write your reason for setting that goal, set a deadline date, break the main goal down into smaller, manageable steps and assign dates in your diary to get to work on each task. Check in regularly, adjust as you go: the key to actually achieving your goals is to check in with them regularly. Make sure you’re actively working towards them, or adjusting ones that no longer fit. I look at my goal list almost daily, to keep me focused and ensure I am always working on tasks that are leading me in the direction of my larger goals. A vision board. First I create a digital one on Pinterest, where I save images that speak to me about what I want to bring into my life in the coming year. It can be big or small, and I write a note under each image so I remember what that represents. Here is mine, not quite complete yet but you get the idea. Once complete, I print out the images and make a physical vision board somewhere I can see it daily. Mine is in my studio above my desk, that way it inspires and motivates me, and I can add to it any time I like. It keeps me motivated to see it every day, a simple visual reminder of the things I am working towards. A word for the coming year. Sometimes I know this way ahead of time, other years it takes me until later in the planning process to figure this out. Susannah Conway has a free resource called ‘Find Your Word’ to help you with this that I really recommend. My word for 2019 is ‘consistency’ and I wrote about how and why I chose that in this post. That word then guides me in my plans and goals for the rest of the year, and informs the things I prioritise. Action clipboards: I use these clipboards, and allocate one to each area of my life and work that I want to focus on. For example, our home renovations. On them I write everything I need or want to do, ideally with a bigger task broken down into smaller steps. Slowly I start to allocate deadline dates to some things, but it’s not a must do for me here and just helps me to feel relaxed knowing everything I need or want to do is written down into sections. It keeps my brain clutter free! Anytime I start to feel too many ideas or to-do’s for something, I make sure I add everything to the clipboards and break it down into smaller tasks. I hang the clipboards in my studio so I can check in with them regularly. A clip board for my monthly goals. I plan for two months at a time, and take cues from all the other things I’ve hashed out in the list above. I usually keep this one pretty close by me, often in the tote bag I use to carry my work stuff around the house. It’s never far, and I check it and update it regularly. A diary: I use this one from Ponderlily. I like to keep a paper diary that I write in with pencil so I can easily rub things out if they need to change. It has all my work and personal appointments in, plus more space to track goals, write notes etc. I use Google Calendar and Acuity Scheduler for all my photoshoots, client calls and mentoring sessions, because I need to have those digitally so that it’s easy for clients to book in meetings with me. Acuity sends me an email at the start of every week to let me know all my appointments, and I cross reference it with my paper diary. My diary is what I take with me and rely on daily. A journal: I love journalling, it’s a powerful tool to get to help me work through problems, improve my mindset and reduce anxiety. I don’t manage it daily, but if I can do it a few times a week than I’m happy. It gives me so much clarity, and keeps me in a constant process of analysing, staying present and grateful for all the things in my life. It’s often through writing that new ideas emerge, and it has become key for me in setting meaningful goals, feeling happier and more fulfilled. Give yourself a realistic amount of time. I like to have about 3-6 hours to look back over one year, and 3-6 hours to plan ahead for the next. One to two full days should do it, but if you’re like me and it’s impossible to find that time in one chunk, allocate 1-2 hours slots for planning over the space of a few weeks or a month. Whatever is realistic for the time you have available, and also for how you work best. I like having a few hours to work on it, then a day or two before I come back to it again to let my thoughts settle. I find I get the best, most insightful results that way. Ignore the noise from every one else also goal setting and planning at the end of the year, and focus on the goals that are important for you. In order for them to be effective, your goals must be realistic and achievable for you. They must be thought out, not just numbers and ideas plucked out of thin air, or because you’re trying to keep up with another creative business owner you follow on Instagram. I know that’s hard to do, I get distracted by that every day and often feel that my goals are somewhat less-than because they aren’t the same as someone else’s. But goals designed from the perspective of driving in someone else’s lane are meaningless, and a waste of your time to set and pursue. Focus inward, that’s the place you need to start this process from to see any real results. Begin with a positive mindset, and create your goals from a place of self love and not a place of self loathing. Ask yourself what you can do each day to nourish your mind, body and spirit, make positive choices to move you closer to where you want to be, and spend your days feeling healthier, happier and more fulfilled. Don’t beat yourself up about what you are not, big yourself up for all that you are. Re-word your goals to make them positive, to make them sound like something you actually want to work on every day. Split your year up into quarters, and get specific about what you want to achieve during each 3 month period. Focus on the first 2 quarters, and then assess the remaining two later on. It helps keeps the process manageable and not feel so overwhelming. I find it hard to see past the next 6 months, so keeping the plan for the second half of the year a little loose and then coming back to it in the summer works well for me. This is especially good if you work for yourself, because often that’s how your year naturally breaks down anyway. I know I find it easier to set quarterly financial goals, for example, than monthly ones, especially as my business is seasonal. Check in with your goals regularly. A goal is only a goal if you are actively working towards it, otherwise it’s just a dream on a bit of paper. Goals don’t work if you set them in January and don’t look at them again until December. It’s a constant process of dreaming, analysing and crucially…doing! Let go of perfection. You’ll be honing your process each year, your goal is creating a system that works best for you. Experiment, play around, and just be aware of how you work best. Are you visual, or analytical? Do you like things done digitally, on paper or a mix of both? As much as I love planning and goal setting at this time of year, I know how overwhelming it can be when you hear and see everyone else doing the same. It’s important to stay aware of how this process goes for you, and adjust accordingly. We are all different, and respond in different ways to visuals, goals, numbers, incentives and so on. While I think there are some key points - like breaking down your goals into smaller, actionable steps - that we all need to help us achieve our goals, there are others which vary wildly between each person. If something doesn’t work for you, change it. If something gets you great results, do more of it. I find my business goal setting is most effective when I look at it in conjunction with what I’ve learnt in my family and personal life too. It means when I’m setting goals for my business I’m also taking into account what I need for my own wellbeing too. It helps me work towards the balanced and well-rounded life that I am striving for, and reminds me that my work is a part of that not just my sole focus. The magic of the process for me comes in the holistic cycle of self reflection, daily journalling, meditation, visualisation and manifestation. Constantly being aware of what I want to bring more of into my life and what I need to let go of. That way, I never have a goal that isn’t meaningful, that I’m not actively working towards and that isn’t improving my happiness, fulfilment and wellbeing in one way or another. It’s kind of magic, and I can’t recommend it enough. I hope you find all my tips useful to start this process for yourself, do let me know if you have any questions at all!